Those dratted ventilation grills, visible from the street. Photo by Michael Horne. 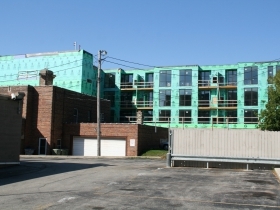 Twenty-seven ventilation grills, each about 6 square feet in area, are attracting unwanted attention at a new building under construction on the northeast corner of N. Oakland and E. North avenues. 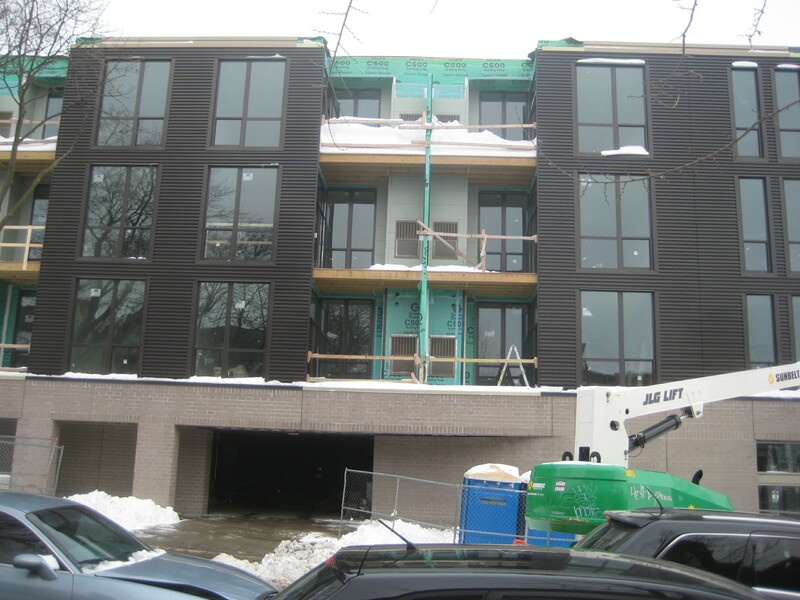 The vents supply fresh air and exhaust ventilation for the heating and air conditioning system of each apartment in the Joseph Property Development project at 1800 E. North Ave. 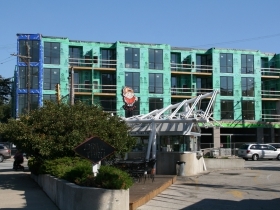 The mechanical equipment, hung on the walls of the building, is clearly visible from the street, and may indeed be the principal, although inadvertent, design element of the four-story mixed use structure. 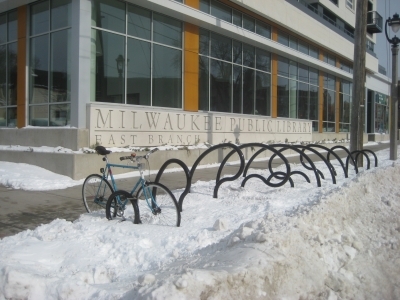 “What we approved did not have the vents,” Third District Alderman Nik Kovac, the chair of the board, said at its February 3rd meeting, held at the East Branch of the Milwaukee Public Library. So, what are we going to do about it, with the building so far along in construction? 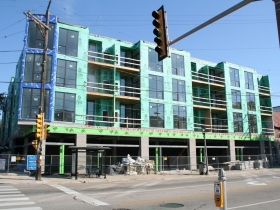 The building facade story came up on the agenda as a matter of new business for the board, which is charged with reviewing all new construction within its boundaries for conformance with the City Zoning Code and the ARB Design Guidelines, which were authored by architect Jim Piwoni. Piwoni is also a member of the East Side BID 20 ARB, and, in fact is the architect of the building in question. He was present at the meeting, but did not address the topic. For most of the first thousands of years that mankind built structures, walls had only two types of penetrations — you either had a window or a door, and maybe a little slot to pour hot oil on marauders below. But now, with advancements in HVAC technology, and with the cost savings associated with them, mechanical equipment that you used to hide up on the roof is now hanging on the walls, taking up a significant number of square feet in the process and cheapening the architect’s purest of inspirations with the vulgar aesthetic outrages of practical mechanical engineers. Fowler went on to explain that for design purposes “you don’t want too much PVC piping sticking out of [the side of] a building.” Sbonik winced at the thought. 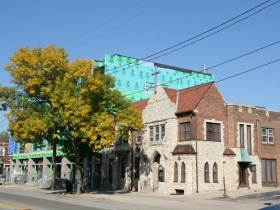 Matt Jarosz, a UW-Milwaukee faculty member with an expertise in Historic Rehabilitation, said that “contemporary designs [like this one] are a little more forgiving” of penetrations of the mechanical sort then are the old commercial structures of the Historic Third Ward, where he also serves on that area’s ARB, as does Piwoni. 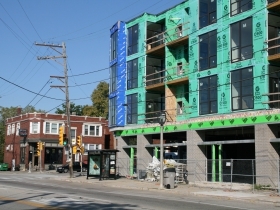 But Jarosz also noted that “small details may be more jarring than a single large one,” particularly when they are repeated 27 times on the surface of a structure, and particularly after neighbors, architects and the review board put so much effort into creating a building facade with a “carefully proportioned system of well articulated and varied bays,” as the design guidelines suggest, and as was done in this case — right up to and including the renderings. But, between the Certificate of Appropriateness and the construction of the building, all of the efforts to “provide street facades with abundant well integrated elements providing surface relief” were rendered moot. 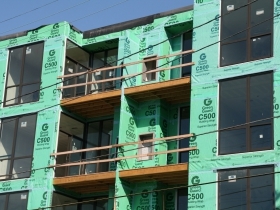 We may have to redefine where HVAC systems are permitted in or on a building and perhaps devise some sort of review system to see that bait-and-switch changes do not occur after renderings have been approved. Ald. Bob Bauman raised a similar issue regarding a MIAD dorm and its as-built vs. approved plans. David Adam “D.A.” Mattox, Construction Supervisor of the Department of Neighborhood Services, outlined some of the difficulties his department has dealing with the inevitable changes in any construction project. Merely assuming that heating systems are rooftop items in an era where chimneys now hang on walls is not enough. The policy “has to be written down somewhere,” he suggested. 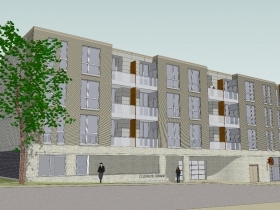 The board is expected to consider “a process for amending Design Guidelines and potential additions, deletions, clarifications for further consideration” at a later time. Procession of bicycle racks. Photo by Michael Horne. Also at the ARB meeting, Ray Chi presented his new plans for the third phase of his three-part art project at the East Branch Library. 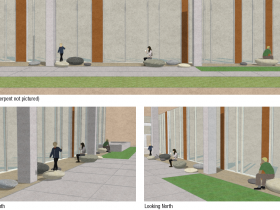 Already installed are a wavy garden and a procession of bicycle racks at the building. 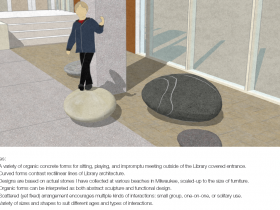 Next is his rethinking of a seating element outside the library. Due to some changes on the site plan as built, he said, his original ideas didn’t work, and he rethought his plans. The curved forms will contrast with the rectilinear severity of the building’s exterior, he said. 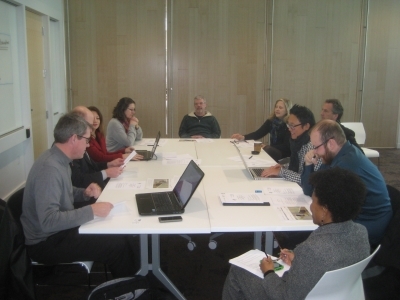 Ray Chi presents his new plans for the third phase of his three-part art project at the East Branch Library. Photo by Michael Horne. Chi is creating the master forms now, he said, out of Styrofoam. They will be followed with a flexible mold, a mother mold and then the casting process will ensue. The cast-concrete elements will include a light foam core in their interior. 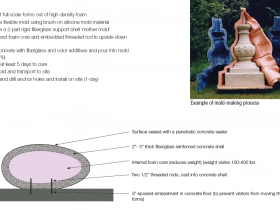 The resulting product will be “durable, waterproof and able to be transported” to the site, where they will be fixed to the substrate by iron rods. The Board approved Chi’s plans. On the other side (more or less) of town, the Business Improvement District #2 “Historic Third Ward” Architectural Review Board held its regular meeting Wednesday, January 28th, at the association offices, 219 N. Milwaukee St. 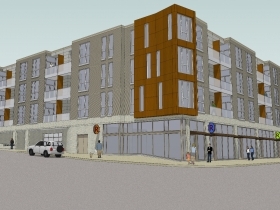 The board approved plans by Eric Ponto to add an accessibility ramp to the 211 N. Broadway Building, where apartments are planned for above shops in the historic building. Ponto said the work will be done around mid-summer. The vault beneath the existing sidewalk is to be removed and replaced with 24 truckloads of fill, he said. 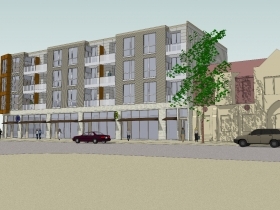 Architect Chris Socha appeared on behalf of his client, Colectivo Coffee, which sought approval for a facade alteration to consist of a seasonal temporary vestibule. Although there is a perfectly good interior entrance to the shop at 225 E. St. Paul Ave., of course nobody uses it, Socha said, and instead enter the cafe through the street entrance, sending a chill you can feel all the way to Brazil. “Why fight it,” Socha said, so Colectivo proposes to install a temporary vestibule windscreen, he said. 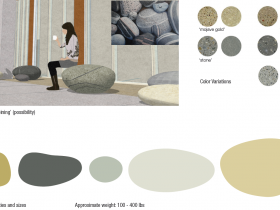 The “slight enclosure of outdoor seating” will “create a microclimate,” near the cafe entrances, Socha said, and the radiant gas heating element of the Sunpak heating system will keep folks toasty within the microclimate, he said. Hot coffee may help, too. 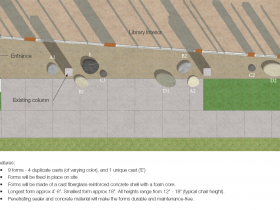 Plans are for a 5 foot clearance to remain on the sidewalk of the cafe, he said. Also, the board approved Colectivo’s proposal to have LED-enhanced letters on the sign on the awning above the entrance to the cafe. The existing sign is of cutout plywood letters, erected to get a sense of scale and placement. The new ones will be permanent and more visible, he said. That’s not all…. what about the tan cap/flashing on the top of the building. The picture doesn’t do it justice. Looks much worse in person. Just use brushed aluminum then it becomes a design feature. Boom. Problem solved. When are we going to learn?…. ‘never believe a developer’. Will it ever stop? Developers continually build something that wasn’t approved! There should be penalties!!!! That may slow it down. Since when is Lincoln Fowler the architectural design guru? For all we know he could have been behind Bay View’s ugly bus stop! 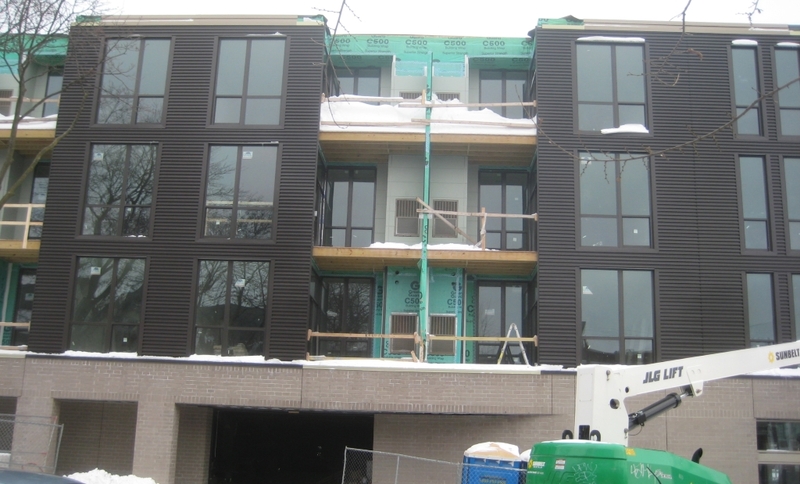 Did the developer “go cheap” and scrap plans for an integrated heating/cooling plant in favor of individual units? In a related thought of other changes to original plans: check out the architectural haircuts on two historic renovation jobs in Milwaukee: Railway Exchange building (SW corner of E. Wisconsin & N. Broadway), and the building at the NW corner of S. Water & E. Buffalo (I don’t recall the building name). You’d have to assume there were plans to replace the missing large scale decorative cornice/crown elements that were lopped off the top of each building. Contemporary views can be viewed at Google Maps with the “street view” photos. Historic photos of both buildings are found on digital websites. I thought about these examples when reading the recent obit. for Paul Jakubovich. I would imagine he had an opinion and a story about both of those buildings (and about the more recent defacing of the carved frieze on Journal/Sentinel building). These grilles are certainly no uglier than the unattractive overhead wires necessary to make our new streetcars move. Streetcar propaganda pictures don’t always show these wires. Bait and switch? The view of City Hall from Water & Wisconsin is interrupted by a massive elevated walkway. As is the view of the French Gothic Gesu church from 12th Street. Milwaukee gave up on looking good decades ago. You do not notice such carelessness in London, Paris or Montreal.